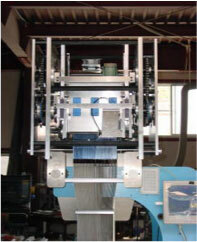 Founded in May 1902, HIMETEX is a Japanese manufacturer specializing in electronic jacquard machines. We also specialize in Electronic design systems (CAD) for the weaving industry. Depending on your needs, we can design, develop, and manufacture high quality and high performance machines. Our goal is to meet all of our customers needs. Copyright (c) 2005 HIMETEX All Rights Reserved.